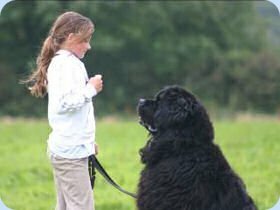 The Southern Newfoundland Club is passionate about promoting all elements of the Newfoundland breed with young people and encouraging their active participation. 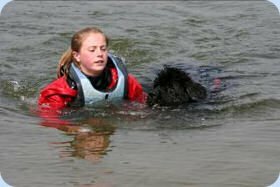 It is our objective to promote Draught work, Water work, Showing, Stewarding, Judging and education about the breed amongst our junior members. In years to come it will be the juniors of today who will most likely be the guardians for the future for our breed! "The committee are absolutely delighted to see that our youth membership is continuing to grow. We would really like to organise some events especially for you, and would love to hear from you to see what you would like to do. Please let us know by emailing our Secretary, Jeni. Her email address is secretary@southernnewfoundlandclub.co.uk. Make sure that you get your parent's or guardian's permission before doing so. For example, would any of the following be of interest to you? 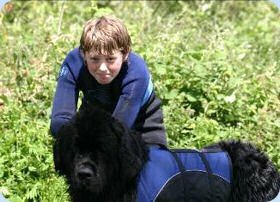 web@southernnewfoundlandclub.co.uk for this web site. "I am happy for my son/daughter's picture to be in the SNC newsletter." "I am happy for my son/daughter's picture to be on the SNC website." "I am happy for you to publish their name with the photo"
"I am happy for you to publish the photo but would prefer my child's name not to be shown alongside the picture." Thank you for being a part of our club, we are very glad to have you as members and appreciate the valuable contribution you make."